The RSFs comprise the coordinating structure for key functional areas of recovery/resilience assistance. Their purpose is to integrate interagency resources and support local governments by facilitating problem-solving, improving access to resources, and fostering coordination among Parish, local, regional, tribal, and area partners; non-governmental partners; the private sector; and stakeholders. The RSFs, created within the State of Louisiana, bring together the core recovery capabilities of State departments and agencies and other Supporting Organizations-including those not active in emergency response- to focus on post-disaster recovery/resilience needs. 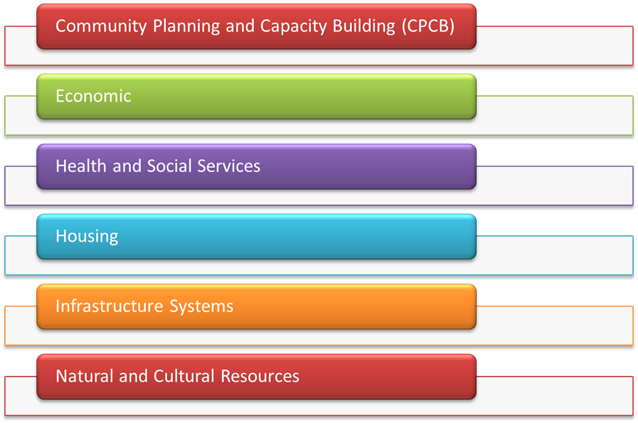 The RSFs are organized into six components. The RSFs will work to achieve those core capability targets within the range of their authorities, skills, resources, and context of the disaster. DCFS is the co-lead with the Louisiana Department of Health (LDH) for Recovery Support Function 3 - Health and Social Services and a supporting agency for Recovery Support Function 4 - Housing. Restore and improve health and social services networks to promote the resilience, independence, health (including behavioral health), and well-being of the whole community.